In part two I will show you how I added all of the details to my hand base that we made in part one. Make sure you have plenty of reference images, and continuously refer to them. First, you need to make the piece that goes just below the elbow. Trace out a pattern on newspaper or wax paper. Test. If it works, cut out in foam, cover in worbla. Paint brown. Next, use a hose clamp for the metal detail around the circumference. Cut off the 90 degree angle so they lie flat on your arm. Paint black. Be sure to use a paint made for plastic. At first I just glued these on. But they kept popping off. Therefore, I ended up drilling a hole through the top, down through my worbla base, and inserting a screw to hold it on. The last image is to see how it looked with the screw. Now, for the hydraulic rams themselves, I first used straws. They ended up being too bendy, but I do recommend using them to get your lengths right. You will need a large diameter pipe with a smaller diameter pipe that can insert into it. I got all of these from the plumping aisle. Cut your lengths from the pipe. Now those 90 degree pipe things we used for the connectors have an inner piece that pops out. You need to connect the pipes to this piece. For the large pipe, I used small pieces of the smaller pipe and used pvc glue to glue part into the popped out piece and into the large pipe (ignore the small pipes in this picture, the idea didn't work). The smaller ones were a bit more difficult, and I had to ask my dad for help. What ended up working is a bit confusing, so I hope I explain it well. We used old bicycle spokes, cut them down, bent the end, and screwed them in. Basically, it created a metal prong that sits on the lip on the pipe, then gets tightened to hold it in place. Also, since we couldn't find a small enough washer, we used a drywall plug and cut it down to make a washer so the screw wouldn't pull through. If that part is confusing, google how a bicycle spoke works and that might help. Or send me a message/comment and I'll do my best to explain. Pop the removable part back in. Now you have your hydraulic rams. You will need to put the small pipes into the bigger ones for them to be complete, but you get the idea. I will come back to these and details later. For the tubes, I got a bungee cord (painted black, then silver), shoe lace (round style, in black, painted silver), and an orange tube (couldn't find a yellow one. Figured this was close enough). Let's work on the hand base now. The thumb area has a few details. I didn't add all of them, but I did a fair bit. Try to drill and screw in your details wherever possible. Glue of any sort will not be as good as screws. Here are some pics of my detailing process. If you have any questions about how I did anything, let me know. Most of this was trial and error and I had to redo things often. The thumb bits were redone about 3 times. The air compressor handle took 4 tries. Keep trying things. And use your reference images a lot. Now back to the hydraulic rams. There is one with a wrench on it and one with duct tape. Also, some of the hoses are tied down. Add those details. The elbow piece needs a gauge and a d ring for a strap (seen in image above). Next time, I'll show you how to do the straps, pads, and other miscellaneous items. Hi, for starters, let me say that I think this looks absolutely fantastic. I've been using your pics as reference images throughout the whole costuming process. I wanted to ask for clarification about the belts. If you rivet them, it seems like the belts/arm is one giant piece. Is this correct? I was thinking of using snaps instead of rivets to prevent this. Also, I'm confused about the use of the D-ring. Are you riveting the cross-body strap directly to a waist belt? Where does the ring come into play? Also, did you find that the waist belt that you attached the cross straps to rode up? These are pretty specific questions, but I'm about to start putting everything together and I don't want to mess it up. Thanks so much for posting all of this. Everything looks great! 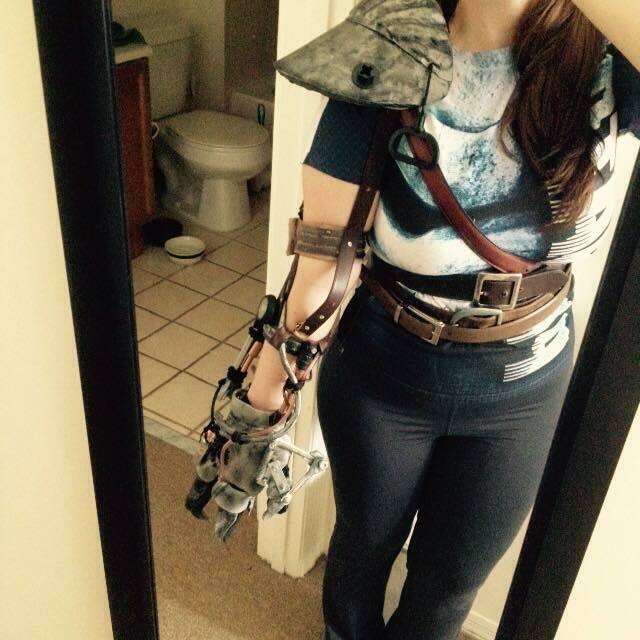 My belts and arm were one huge piece and it was a nightmare getting it off and on again. So using snaps is a much better plan. The D-ring is used on the upper part of the arm (the bit the would go over the elbow stump) to attach the belting. A snap in this location would actually probably be best, and rivets for everything else, as it would allow the belts/shoulder pauldron and the arm to be separate. My belts didn't ride up at all, but I also wore an actual steel boned corset, so that could be why. Good luck on your build and I hope you share pics with me!